The LCAP is an ambitious document created from the input of the Laguna Beach USD community and the touchstone by which we guide and execute our efforts to educate children. It is comprised of goals that focus District practices and resources to ensure students are college and career ready upon graduation. The LCAP shows the alignment of LBUSD curriculum, instruction, assessment, and interventions with the eight State priorities. All stakeholders understand how the LCAP is constructed, how it reflects the District vision and mission, and the importance of ensuring fidelity to the goals. This document meets both the requirements of the state and the expectations of the District's stakeholders. The LCAP is a significant change in how school district funding priorities have been set, for the first time mandating significant engagement of stakeholders and demanding specific accountability for the effectiveness of the adopted strategies. The Local Control Accountability Plan is a component of the Local Control Funding Formula (LCFF). Under the LCFF, all local educational agencies are required to prepare an LCAP, which describes how districts intend to meet annual goals for all pupils, with specific activities to address state and local priorities. On June 12, 2018, a Public Hearing was held regarding the submission of the 2018-2021 LCAP for Board of Education approval. On June 26, 2018, the LBUSD Governing Board approved the 2017-20 Local Control and Accountability Plan. 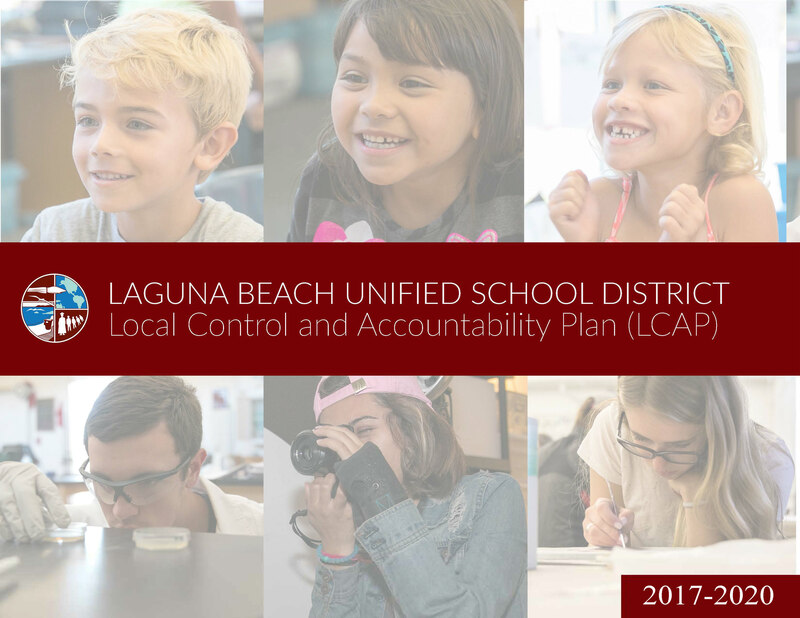 The Laguna Beach Unified School District thanks the community for its efforts in the development of this Local Control Accountability Plan. 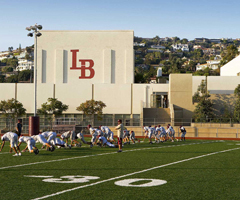 LBUSD encourages input in the planning and update of the Local Control and Accountability Plan. If you have any questions or comments regarding the LCAP, please email cmabery@lbusd.org or complete our LCAP Feedback Form. The Annual Update and Local Control and Accountability Plan was presented for Public Hearing at the regularly scheduled LBUSD Board meeting on June 12, 2018, and was Board approved on June 26, 2018. LBUSD encourages input in the planning and update of the Local Control and Accountability Plan. If you have any questions or comments regarding the LCAP, please email cmabery@lbusd.org. To create the plan, school districts must engage parents, educators, employees and the community. LBUSD is focused on improving communication and involvement of all stakeholders, through stakeholder information meetings, School Messenger, the school and district websites, and stakeholder advisory groups. According to the 2017 LCAP Survey, 80% of parents are satisfied with the communication they receive and 75% of parents and staff say that the district encourages parent input. Our Annual LCAP Survey received 464 parent responses in 2016-17, increasing from 339 in 2015-16 and 193 in 2014-15. The parent participation has more than doubled since 2014-15. We also surveyed 1700 students, up from 700 in 2014-15. This data shows that LBUSD has dramatically improved our ability to receive feedback from parents and students. California is field testing a new website designed to help communities across the state access important information about K-12 districts and schools. Called the California School Dashboard (https://www.caschooldashboard.org), the site features easy-to-read reports on multiple measures of school success, including test scores, graduation rates, English learner progress and suspension rates. The Dashboard is part of California’s new school accountability system based on 2013’s Local Control Funding Formula. It is the next step in a series of major shifts in public education that have raised the bar for student learning, transformed testing and placed the focus on equity for all students. To further describe the California School Dashboard, LBUSD has created a short video. Why a new system and a new tool? The Dashboard is a key part of California’s commitment to transparency and continuous improvement. California’s future success depends on tapping into the potential of all students, so they graduate ready for college, careers and life. For schools to reach this goal, teachers, parents and the community need clear and useful measures of progress. As an accountability tool, the Dashboard will help the state identify schools (including charter schools) and districts needing targeted assistance. In the past, accountability systems for districts and schools relied solely on test scores. But one test taken on one particular day doesn’t provide a complete picture of all the ways schools are helping students succeed. Think of it this way: You can’t drive a car by only watching the speedometer. You also keep your eye on the road, check the mirrors, monitor the gas tank and pay attention if the engine light comes on. Similarly, the Dashboard provides information on different aspects of student performance, which will give a more complete picture of a school’s progress. The Dashboard also reports on growth to show a school’s trajectory over time. The Dashboard is deliberately designed to be a work in progress: Metrics and reports will be added over time. During the field testing phase, the state will be gathering feedback to make additional modifications. The exciting changes taking place in education will take time to fully implement. While schools are making progress in many key areas there is always more work to do. The Dashboard is part of an ongoing conversation with our community on both how we’re doing and how we can do better. Meeting goals will take a united effort, and I look forward to working with our families to ensure success for every student. This section aligns the goals with measurements during the three years of the plan. The goals, based on LBUSD’s strategic goals, have been set to meet identified student needs and student program goals. These goals align with the 8 state priorities: student engagement, student achievement, school climate, course access, parent involvement, implementation of state standards, other student outcomes, and basic services . Each goal is assigned one or more progress indicators—metrics that are either quantitative or qualitative. The progress indicators, some of which are required by the state, are used to monitor the implementation of the LCAP. This section identifies the LCAP actions and services, as well as related expenditures. The School Site Council serves as the school community representative body for determining the focus of the school’s academic instructional program and all related categorical resources. The legislative intent for the formation of a school site council is that individuals who are most affected by the operation of the school should have a major role in the decisions regarding how a school functions. Education should be a joint effort of parents, teachers, administrators, and other school staff – those whose common goal is the success of all students. To set school goals, the SSC should carefully review state and district priorities as stated in the Local Control and Accountability Plan (LCAP), and assess both state and local quantitative and qualitative student achievement and other data to evaluate the effectiveness goals, actions, services, and expenditures. (Adapted from the California Department of Education (2017) “Single Plan for Student Achievement”). Please use the links below to access the SPSA for each school site.